No tones this week. I’ll try to get them put in later but, for now, I’m just glad I was able to get THIS done before I missed another week. All these characters! 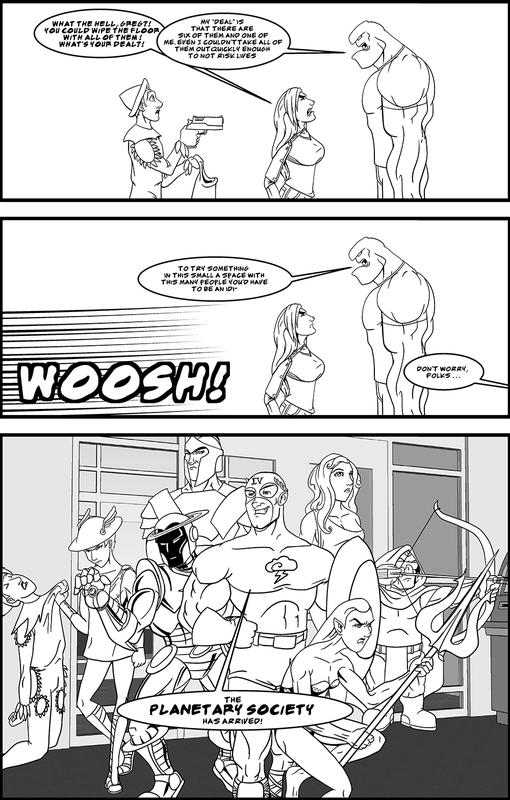 In case you can’t tell, this is an Avengers parody. I have to say it is a parody so as not to get sued. Not pictured is Uranus because I couldn’t fit her in the pis without it being that much more crowded, so we’ll say she’s bringing up the rear (I’m so funny). And yes, Pluto is the dwarf. Glad to see that in this reality Pluto is still a planet. It’s General Collateral Damage, Bystanderbane, Miss Traffic Hazard, Token Useless Water Powers Girl, The Scowler, and Mr. Too Much Time and Money Man! I see no way in which this carefully crafted strategy could POSSIBLY go wrong inside the rather small confines of a typical bank, probably constructed out of nicely shatterable stone. Oops, forgot Hyper Metabolism Guy what keeps Dominoes Pizza in business. …eh, he’s a speeder. Who cares about speedsters. Bet Greg punches Jupiter in his wreath donned forehead at some point. Just loving the A2A clown’s expression in panel one as they bicker. Right, because Mercury was the messenger of the gods, and therefore speedy; I’m keeping up! Ummm. Is Neptune’s right hand transparent? Might as well make it canon. Where are the planet people for Earth and Uranus?